KELOWNA, British Columbia – In light of stiff new competition from the Ford Focus RS and Volkswagen Golf R, the Subaru WRX STI is getting spruced up for 2018 before a complete makeover expected around 2020. When that happens, the Subaru WRX STI will most certainly be built on the recent Global Subaru Platform (GSP) on which the latest Impreza and the upcoming new Crosstrek are based. But for now, the current version will carry on with a few touch-ups and some technical modifications. The base price is $39,495, but the best equipped version can easily run you $46,000. Unless you’re a diehard fan of the STI, you’re unlikely to even notice the changes made to this all-wheel-drive vehicle for the 2018 model year.The grille is now slimmer and the central air intake located under the bumper is bigger, as are the lateral air intakes that cool the brakes and replace the fog lights. The car boasts the same C-shaped LED daytime running lights as thesporty Subaru BRZ, and the STI is now equipped with standard adaptive headlights that turn in sync with the steering wheel. The 19-inch alloy rims are fitted with Yokohama Advan Sport 245/35R19 tires instead of the Dunlop tires found on last year’s version.The Brembo brakes’ ventilated discs have six-piston callipers in front and two-piston units in the back. These callipers are painted a unique colour that I call “wasabi green.” A massive spoiler overhangs the trunk and is high enough that it won’t interfere with rear visibility. Subaru is also offering buyers a much smaller and more discrete trunk spoiler, which will suit those who want to fly under the radar. The STI’s passenger compartment has also undergone subtle modifications with the addition of black mouldings, a small integrated screen – borrowed from the Impreza – in the centre of the dashboard and gauges with white numbering and red needles, which is the opposite of the previous version. Moreover, all STIs are now equipped with red seat belts and a central armrest with two cupholders for the back seats. 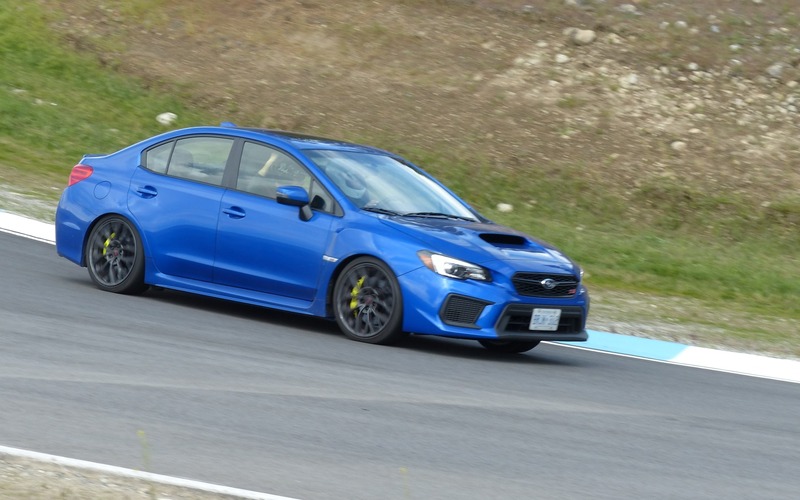 For our first drive of the 2018 WRX STI, Subaru took us to Kelowna region, where we travelled more than 1000 kilometres in two days on the area’s gorgeous roads and did several laps on the new Area 27 circuit located near Osoyoos, designed by Jacques Villeneuve. The car is just as dynamic as before and its reactions remain very precise, due to the excellent front-end geometry, new tires and the hydraulically assisted steering that helps gauge traction levels. 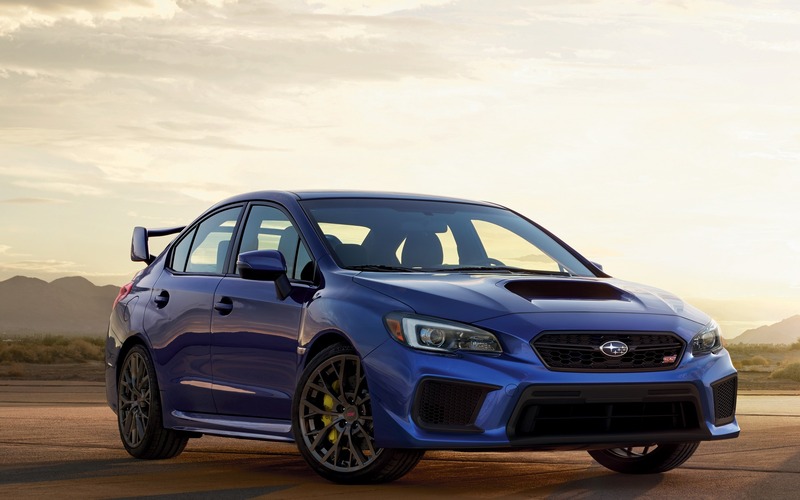 From a technical point of view, the 2018 Subaru WRX STI comes with a new electronic device that manages the central differential and replaces the previous version’s purely mechanical system. With this controller, the central differential reacts faster, which makes the WRX STI’s ride much smoother at high speed. You can feel the difference on the road, but even more on the track since it’s easier to make the most of its full performance potential in a controlled environment. On the superb Area 27 circuit, the WRX STI was in its element with a ride that was as fluid as it was precise. My only regret was not having a more powerful engine. In short, the WRX STI’s chassis is so balanced that the car could easily handle a 350-plus horsepower engine. That being said, the 2.5-litre boxer engine does an excellent job with very subtle torque delivery, so thrills are guaranteed. Add to that a remarkably precise six-speed manual gearbox and you’ve got an exceptional sports car with classic handling. All the ingredients are there, it could just use a little more punch coming out of turns. Why so few changes for 2018? In a nutshell, Subaru doesn’t feel that more is needed right now. In 2016, the Japanese brand sold 4217 units of the WRX and WRX STI in Canada, some 1110 vehicles more than the year prior. Moreover, between 2013 and 2016, sales of these two versions jumped 127%. Finally, the WRX and WRX STI maintain a very good resale value of 65% and 66% of their original price, respectively, after 24 months use. Basically, there’s no rush to make improvements. 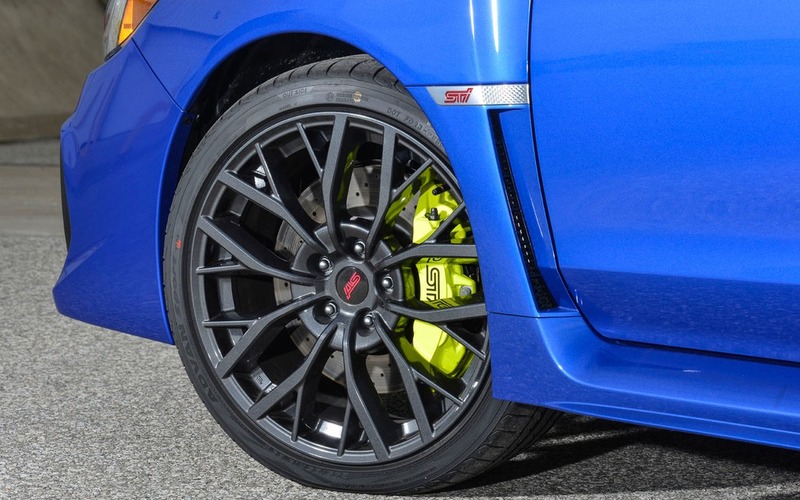 The WRX STI stands out as a real beast thanks to looks, performance and classic handling. Unfortunately, it isn’t alone. The Ford Focus RS can be every bit as radical and the Volkswagen Golf R delivers similar performance with a higher degree of refinement to boot. The 2018 WRX STI is more balanced and more dynamic than the previous version. It has most certainly evolved, but it’ll be a few more years before the WRX STI truly enters a new era. 6/10	Decent – no more, no less. 6/10	There’s better insulation against wind noise, but road noise is still an issue. 9/10	Still one of the STI’s strengths, but the chassis is so well balanced that the engine could be more powerful. 5/10	Still lagging behind the competition. 8/10	The chassis is dynamic, handling is excellent, and the driving experience is top-notch. 8/10	It’s not alone out there. While dynamic, the STI lacks refinement compared to the Golf R.